NEW! Give everyone that warm and fuzzy feeling with our gathering of nostalgic Passover treats. Includes coconut and chocolate-covered macaroons, Barton's almond bark, assorted mini fruit slices and a marble loaf cake. PLEASE NOTE: Based on production problems, Barton's did not produce the Barton's Kiss Tin for Passover this year. We are substituting this item with a 5.5 ounce box of Barton's almond bark-whole roasted almonds in bittersweet chocolate. We are truly sorry for this inconvenience. Serves 8-10. Kosher for Passover. 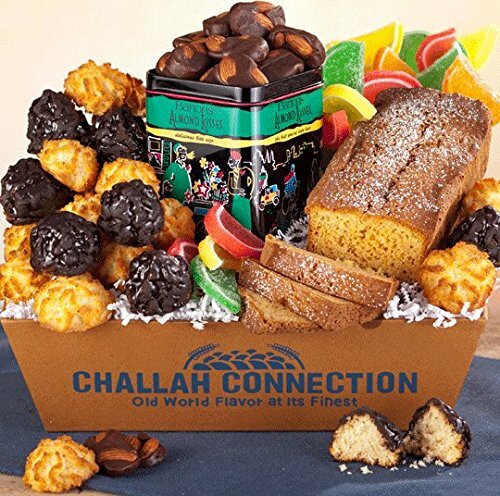 If you have any questions about this product by Challah Connection, contact us by completing and submitting the form below. If you are looking for a specif part number, please include it with your message.